dolphe Appia (1862-1928) dared to criticise Wagner: while recognising his genius as musician and poet, Appia thought Wagner both to have been limited in his concepts of staging and (as he makes clear in the extract below) to have been naive in his expectation that nature could be represented on stage with realistic effect. Appia advocated an expressive rather than a naturalistic staging of Wagner's dramas. He proposed an hierarchy of scenic elements, with the actor at the top of this hierarchy. All inessentials were to be removed from the staging and, since the actor was a three-dimensional creature, also the elements of the staging should be three-dimensional with the possible exception of the backdrop. Appia was one of the first designers to understand the potential of stage lighting to do more than merely illuminate actors and painted scenery. His ideas about the staging of "word-tone drama", together with his own stagings of Tristan und Isolde (Milan 1923) and parts of the Ring (Basle 1924-25) have influenced later stagings, especially those of the second half of the twentieth century. The following paragraphs are quoted from his Music and the Art of the Theatre. n Parsifal and the Ring the episodes of the plot do not correspond to the essential inner action, but whereas in Die Meistersinger the contrast between the external events and the inner meaning is central to Wagner's intention, in the Ring it is the complete development of this external life in itself which must be the cause of the conflict in the hero's soul, and converge with the inner life to form the denouement and the conclusion; hence the colossal dimensions of this drama. arsifal did not require such a complex plot structure, for the transformation within the hero's soul is not brought about by a series of causes and effects, but results from the hero's vivid realization of universal suffering. The events which bring about the suffering are of only secondary importance to the inner action. Thus, the production problem in Parsifal differs from that of the Ring in that the duration and sequence of events are determined by the duration and sequence of the psychological development of the hero and not by the events themselves. Therefore, the ideality of the musical time pattern is far more independent in Parsifal than in the Ring, because the inner action, the object of the drama, is entirely within the domain of the music: its duration is by its nature limitless. Furthermore, the visual expression which must be evoked by this inner action is absolutely indeterminate: only through suffering can the hero's compassion be revealed, but there are innumerable kinds of suffering. Consequently the fable in Parsifal assumes a particularly arbitrary character. To avoid too great a disparity between the episodes of the plot and the high significance of the musical expression, it was necessary to set the production in an ideal atmosphere where the episodes would acquire a kind of universal significance and would be in harmony with the inner world which was revealed. This Wagner did, and it is well known with what artistry he seized upon a traditional form of suffering and by means of the music identified it with the suffering of his characters. Nevertheless, this defers but does not solve the problem of staging this drama. 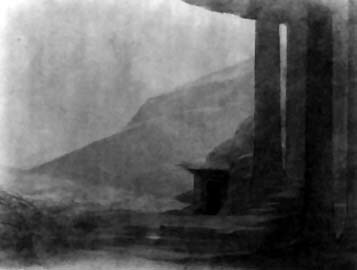 Left: design for 'Parsifal' act one by Adolphe Appia, ca. 1896.
he time patterns of the music in the Ring are extremely complex. The human life which determines the drama's general form and the sequence of its episodes is continually being disturbed by the mythological anthropomorphism of certain of the characters. The epic poem can easily encompass this kind of complexity; so can the spoken drama, although it is necessary to reduce its scope considerably. But the extreme facility with which the music can express it creates a problem for the word-tone dramatist [i.e. Wagner] which presently we shall see is entirely one of production. he evolution taking place within the soul of Wotan is expressed by [all of] the episodes of the play as well as in the passages devoted especially to him. Wotan's personal existence and everything else in the drama are but two aspects of a single phenomenon. From a purely naturalistic point of view, the incidents are responsible for Wotan's developing awareness, but from the standpoint of the poetic intention of the drama the incidents themselves must be considered to be that development. Because he is a god, Wotan has the painful privilege of at the same time revealing and contemplating his own soul. How can the two aspects of this conflict be presented consecutively with clarity? How can the musical pattern be flexible enough to find a mean between the complete and poetic independence and relative subordination to the realistic order of facts? hanks to Wagner's special genius, the episodes of the Ring are remarkably intense and well-defined. However, there are passages where the music is strictly subordinated to the realism of the plot, which deprives them of the free expression with which other passages can be invested. Is their activity solely due to the power of genius or is it part of the dramatic action? A drama which is in a sense the objectification of the soul of a god obviously cannot be too rich, for his magnitude is revealed through his creations. On the other hand, the indispensable space dedicated to Wotan's personal existence remains completely undetermined. Nothing can dictate its dimensions nor its order; it is the domain of pure musical expression, and the more obvious this is, the clearer will be the realistic opposition and the ideal identity of the two faces of the drama. efore these apparently contradictory conditions, Wagner found himself captured by the principle of the inflexible setting based on an impotent realistic convention. As we have seen, Wagner's vision could adjust to the realism of sequence and form; only the inflexibility of the setting was opposed to his conception. And yet he sought mobility through extreme realism. The notion that an expressive setting could achieve the mobility he was seeking seems never to have occurred to him. For Wagner, everything that happened on the stage had a real existence. 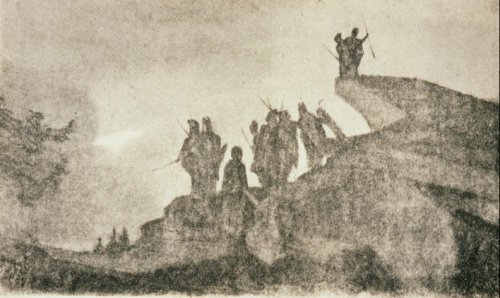 Right: design for 'Die Walküre' act three by Adolphe Appia, ca. 1896.
ll the scenes of the Ring are laid outdoors and nature in all its aspects is used throughout the play. Thus, the role Wagner assigned to the landscape painter in The Art-Work of the Future would theoretically have its richest opportunity for practical application in this drama. But Wagner was too much the artist to use a work of art merely to illustrate his theories. He would have been more likely to use his theories to explain the artist's irresistible but still little understood impulse to create. Although at different times he says that the painted drop is a background which the landscape artist provides for the actor, nevertheless, when it comes to the specific dramatic conception, only man and nature at grips with each other, the actor plunged into the scenic picture, can satisfy him. But natural phenomena are highly mobile and the human being in the midst of natural phenomena partakes of this mobility. Then a harmonious relation is established between them. We know that in order to be united, actor and setting must sacrifice; the actor must yield some of his personal independence and the setting must dispense with a considerable portion of signification (multiplicity of specific detail). The setting will thus acquire an expressive character which will influence the dramatist's intention, for as soon as the word-tone poet can depend on the setting as a means of expression, he can permit his intention can develop freely. The opposition between expression and signification remains the only law restricting and guiding the creation of the score. A drama in which nature plays so large a part as in the Ring is therefore incompatible with the principle of production adopted by Wagner. But if the creative impulse is strong enough it will transgress all conventions, break through all barriers. This occurs in the Ring: Wagner ceased to adhere to those very conventions which he had endorsed; he wished to present on a traditional stage the phenomena of nature with an impractical realism. In short, he believed he had achieved freedom in visual expression, but he was unaware of the secret of that freedom. This contradiction is inherent in the score of the drama and must be acknowledged if it is ever to be properly produced. nly the above- mentioned intensity of the episodes, since it depends upon a sequence of realistic events, is affected by this contradiction; for it was only with respect to this intensity that Wagner failed to appreciate his inability to achieve complete freedom. The pure musical expression, on the other hand, exists in and dominates a boundless sphere which is the natural element for a creative power such as Richard Wagner's, and neither its conception nor composition could be affected by any extraneous consideration. Except in the purely episodic passages, the purely musical expression attains a power in the Ring which has never before been equalled in the history of the arts. But since this sheer musical expression is by nature alien to the intense realism which controls the intention of the rest of the drama, it disregards any possible scenic movement, and constitutes a series of rests within the form of the production as a whole. A mise en scène created on the expressive principle can permit all relationships; more, it can realize them progressively with perfect timeliness. When I speak of "rests" in the form of the production, I refer to a type of poetic-musical combination perfectly legitimate in itself, but to which the scenic principle utilized by Wagner cannot be adapted, which he did not realize, and which incontestably constitutes a violation of the integrity of the production. hus, we find in the Ring both realistic episodes which are almost impossible to present adequately on the stage and a completely independent poetic-musical expression which is in conflict with the form of production adopted for both. 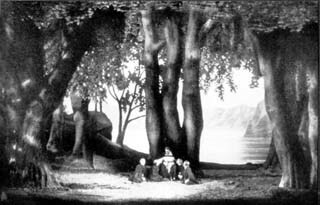 Left: staging of 'Parsifal' act one by Wieland Wagner, Bayreuth 1937.
hat is true of the score of the Ring applies to a certain extent to that of Parsifal, although in the latter the scenic requirements are far simpler. The music controls the whole poetic conception of Parsifal, so that the realistic elements in the plot must be kept to a minimum, in order that the divergence between the realistic elements and the great significance of the musical expression shall not become so great as to destroy their mutual relation. To avoid this Wagner has employed every device at his command. There is hardly a moment in the drama when the realism of the plot is not in some way tempered or idealized. As he makes Gurnemanz say, Here, time becomes space . This eliminates the idea of a specific locale. And when the object of this paradox becomes some other locale, Wagner again evokes his characteristic magic to confuse time and space. he interrelationships of the characters are of an ideal nature, without material analogy to those set up by real life. Some of the characters are ageless, personifying in a vague and disturbing way the idea of the transmigration of souls. In much the same way, such elemental ideas as death, sleep and physical pain assume straight off a transcendental significance. As in ancient drama, the law of cause and effect is almost entirely eliminated as a motivation for the action, with the obvious purpose of emphasizing the evolution within Parsifal's soul which is the direct effect of the action. As for the setting itself, Wagner has succeeded remarkably well in uniting it with his poetic idea. The setting unfolds and is several times transformed before our eyes; even the daylight seems to be subject to a divine or diabolical principle which transcends physical law. But this almost ideal mobility remains, nevertheless, deeply realistic, in the sense that the characters take part in it consciously; they even cause these transformations, under the influence of ecstasy or of some supernatural inspiration. 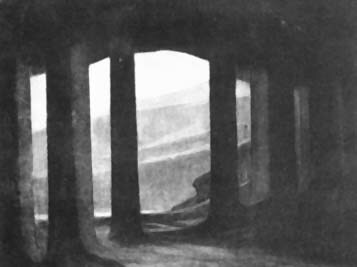 Right: design for 'Parsifal' act three by Adolphe Appia, ca. 1896.
hus, the Ring and Parsifal are similar in scenic conception for, contrary to all appearances, their production is realistically conceived. They differ only in that in the Ring the scenic requirements are impossible of fulfilment, while in Parsifal they are achieved through an idealization of the setting, which here almost achieves an expressive form, without violating the intent of the artist. Indeed, the characters in Parsifal are, to some extent, an element of expression; and it is as such that they are presented. To achieve this effect, the poet has relieved them of all responsibility to reality, and as a result their participation in the drama is itself drawn into the realm of pure expression. n this respect, as in all others, Parsifal may rightly be called a Bühnenweih- festspiel (holy festival of the theatre), for it consecrates the stage upon which it appears. Indeed, Wagner accomplished a miracle in his last work. He overcame the obstacle and problems of visual realization with weapons more powerful than any technical principle. Appia's enduring achievement consists for the one part in rekindling the torch of the composer's own reforms, and for the other in demonstrating that their significance extended far beyond Bayreuth and 'carried a powerful charge' for the theatre as a whole. Plainly, in his rejection of the whole nineteenth-century ideal of literal depiction which was the foundation of Wagner's own stage practice, Appia was pushing the boat out into new and uncharted waters. While there can be no question that Appia was in tune with the moves against picturesque realism that emerged with Wagner's own production of Parsifal at Bayreuth in 1882, Appia's programme was far more iconoclastic than anything the composer himself had imagined. Appia's iconoclastic assertion was that he knew better than Wagner how his works should be staged. It was, and is, an extraordinary claim, and if vindicated by history still merits critical examination. His scenarios from the 1890s are every bit as confident in their dogmatics as Cosima was in her stage practice. But while both believed they were in tune with Wagner's deepest intentions, they were facing in opposite directions. Cosima's premiss was that what Wagner himself had done was right, while Appia's was that he had got it all wrong, and of these Appia's was obviously the more contentious. As we have seen, he had posited a fundamental contradiction between what Wagner had composed and how he had sought to stage it. But the trouble with his argument that 'the musical score is the sole interpreter for the director' is how to distinguish a correct from an incorrect interpretation. The composer believed, by and large, in his pictorial, literalistic scenarios, while Appia was equally convinced that his anti-realistic ones were far more suitable. Ultimately there can be no logical way of deciding between these or any other claims. They are all beside the real point, which is that no single interpretation of a great work, including that of the composer himself, can be definitive. All are necessarily a product of the taste of their time, their strengths and weaknesses the proper study of criticism and debate.